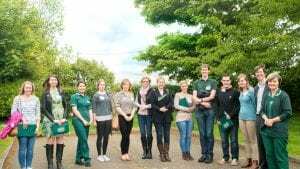 Davies Veterinary Specialists played host to local vet nurses at its exclusive networking event in Higham Gobion, Hertfordshire on Saturday. The occasion was held to celebrate Veterinary Nursing Awareness Month (VNAM). The day began with refreshments in the lecture theatre, giving attendees a chance to meet the team and watch a short presentation about nursing at Davies. A representative from a selection of our services then held a short talk on how the nurses are involved in their specific discipline, what their role entails and examples of interesting cases. 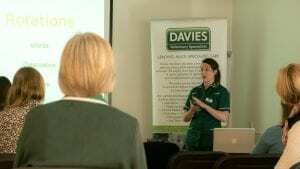 The lectures were informal yet bespoke to the nurses and gave the attendees a real insight into the working ethos and caseload at Davies. Diagnostics: Assisting with everything from the diagnostic imaging of critically ill emergency cases, to routine follow-up radiographs, as well as working with advanced diagnostic equipment. Patient Care: VNs have an important job, ensuring that all the patients under our care have a comfortable and smooth recovery and managing and monitoring treatments. So tell us a bit about the day? We arranged an informal networking day firstly to support National Nurse Awareness Month and secondly so we can really get to know the nurses out there and tell them more about what we do, and who we are. We have the very best world-renowned specialists working here at Davies dealing with the most challenging cases. While we are not a training hospital, we really want the nurses out there to see how cohesive, collaborative and friendly our teams are. The nurses are so well supported and encouraged to learn and take responsibility and we really wanted the opportunity to showcase this side of our culture – it’s an excellent place to learn and grow as a nurse. Will you be holding more of these days in the future? Yes. The day was educational and insightful and the feedback represented this. The attendees were all extremely positive and those we spoke to individually said that they had really enjoyed the day. Charlene, our Patient Care Nurse Supervisor, and I were able to sit down and speak to the nurses after they had networked with our specialists and nursing team to get to know them. I now have a number of students with whom I will be keeping in touch, keeping in mind they may like to join Davies once they are qualified. We‘ll most certainly be organising more events. See our Nursing recruitment page to find out more about veterinary nursing opportunities at Davies.